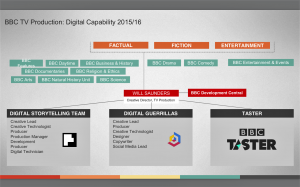 A digital production team embedded within TV with a mix of both editorial and interactive expertise they became a key supplier to BBC Taster, quickly learning how to use new storytelling tools like Touchcast & Interlude. Their collaboration with BBC Arts & Hip Hop Artists “Run The Jewels” won a BBC Production Award. 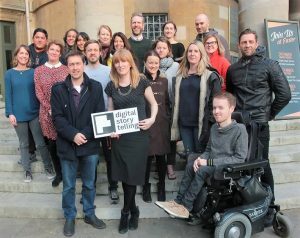 When BBC Three made the decision to move online, we put a renewed emphasis onto social and short form storytelling, developing and winning a number of commissions for high end factual content in iPlayer like “Life & Death Row: Love Triangle” & social first stories including “Bodyhack” which was conceived as a story to be shared on You Tube & gaming platforms and which went onto win a Lovie award in 2016. BBC Learning also became a valuable source of new business, and outside of R&D were the first part of the BBC to commission VR projects. DST’s Technical Lead Tom Burton conceived and produced the award winning “Home” VR project for HTC’s Vive. Home was a collaboration with BBC Science, based around Tim Peake’s astronaut training programme & it will be released into VR Appstores in 2017. Under the careful stewardship of Creative Lead Georgia Moseley & Unit Manager Laura Jordan Rowell we grew turnover from £260,000 in 2014 to £940,000 by the end of 2016. A core headcount of five grew to a team of seventeen, with that moment celebrated on the steps of All Saints Church, outside New Broadcasting House.